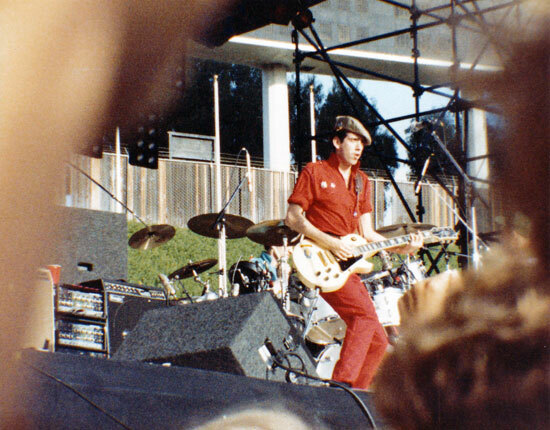 One of the things I found in a recent excavation of a box of my old stuff that was in my mom's garage was a photo envelope containing some fuzzy snapshots I took of the Clash at this daytime show at the Oakland Coliseum in 1983. I love how you can see the gear. (Mesa Boogie combo!) And the beret. And the jumpsuit. This was a "day on the green", and the Clash were the support act on the Who's "It's Hard" tour. Those girls and I gloried in the bravado of being so "punk" that we saw the Clash and left before the Who went on, which is what we did. Doing that doesn't seem nearly so cool now. In fact, it was pretty stupid. Still, we and us man, youth. It was a heady time of fun, horny, fake rebellion that has basically been forgotten in a box for thirty-three years.